Founded as a football club in 1943, the “running section”, as it was initially known, of Giffnock North AAC took off during the marathon boom of the early 1980s. A junior section was formed in 1990. Over time, the club morphed from a traditional harrier club to include track and field and was renamed accordingly. Using the local suburban roads, parkland and football pitches adjacent to the football clubhouse, a coaching pool was developed and the club steadily made an impact in local and national events. Membership mushroomed and the club climbed up the regional league divisions. Clubrooms are located off Braidbar Road in Giffnock, although members train at numerous locations including Williamwood High School, Eastwood High School and Hutchesons’ Grammar School as well as at the Emirates Arena, Nethercraigs track and nearby parks such as Rouken Glen and Linn Park. The lively under 11s section is headed by Clare Stevenson with senior distance coach Dudley Walker taking control of the middle distance and endurance group. The aptly-named Billy Glasgow supervises the sprinters and field athletes while Ken Allan specialises in coaching the jumps. Bernie Campbell oversees senior endurance runners and also conducts coaching workshops across Scotland. Giffnock North compete in several leagues including the Central and South of Scotland League for male and female under-11s through to veterans. Female members participate in the Scottish Women’s League while Giffnock’s men compete in Division 2 of the Scottish Athletics League. At junior level, the club has under-13 and under-15, boys and girls teams in the Lower Youth Development League. Middle distance runner Neil Gourley came on in leaps and bounds this season, gaining selection for the European Under-23 Championships in Tallinn, Estonia. With personal bests in the 800m to the 3000m, his efforts were rewarded with a silver medal. Rachel Alexander’s long jump prowess landed her a well-earned place in the Scotland squad at the World Youth Games 2015. The club continue to build progress on a philosophy of ‘Everyone is welcome; whatever the ability,whatever the aim’. Whilst continuing to absorb new athletes into their current training groups they work hard to protect a preferable coach to athlete ratio and aspire to ensure safe practice. Staying true to it’s 1980s marathon-boom roots, Giffnock AAC have an award for athletes who have attained a commendable level of performance in the marathon. Each year, a marathon club honour is awarded to athletes achieving sub 3hours (men) and sub 3hours 30 minutes (women). Giffnock’s high jump squad has produced an inspirational crop of competitors including David Smith who earned the club’s first Commonwealth vest at the Glasgow Games last year. With multiple national champions in the endurance squad, the middle distance runners have earned aformidable reputation with Sarah Eunson leading the way by claiming Lynsey Macdonald’s 35 year old national indoor 800m record. Throughout the year the club arranges several events, most notably its schools cross country event which attracts entries of up to 400. Events such as the Rouken Glen 10km and Running Festival with a5km and children’s races all in and around Rouken Glen Park, arealso hosted by Giffnock North. 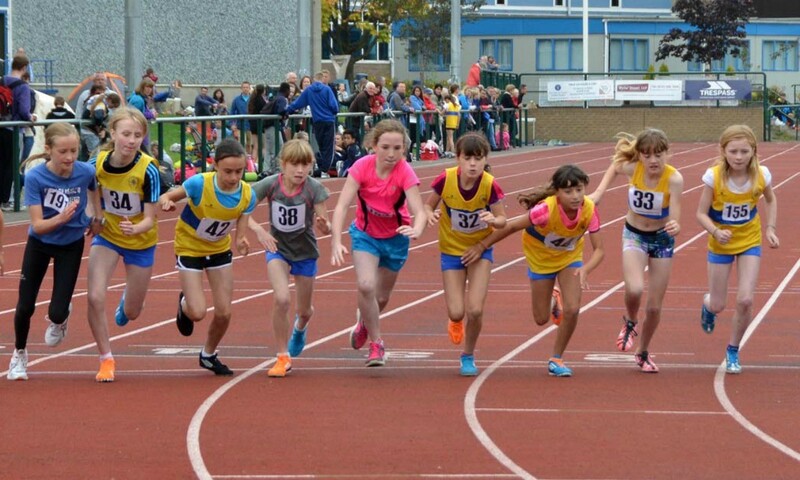 Like many clubs, since the Olympics in 2012 and the 2014 Glasgow Commonwealth Games, Giffnock AAC have encountered a consistent rise in membership and reluctantly had to impose awaiting list for new junior athletes. With these increasing numbers, more qualified parent-helper or coaching assistants are needed to ensure an undeviating high level of athlete welfare. There are also First Aid sessions, Meet the Parents Nights alongside sold-out informative seminars with former GB athletes and coaches. A junior multi-events squad encourages younger athletes to take part in several events and develop skill in each area. As the athletes develop they are encouraged to attend other squads to ensure they have had a go at every event and know where their strengths lie. The Multi Squad meets on Monday and Friday, 6pm at Eastwood High School track. Number of members: 540 juniors, 145 seniors.